What a night / morning it has been. On the undercard, Nathan Cleverly lost his WBA light-heavyweight title, but Savannah Marshall made a winning start to her professional career, before Gervonta Davis won, although he he had lost his IBF super-featherweight title the day before when he failed to make the weight. And the main event did not disappoint. Many gave Conor McGregor no chance, but he made a bright start, before Floyd Mayweather's experience and skill proved crucial as he stamped his authority on the fight before forcing a stoppage in the 10th round. Hope you all have enjoyed it as much as we have. Thank you for joining us and for all your comments. That concludes the end of this page, so until next time, bye for now. Manny Pacquiao, who fought Floyd Mayweather in one of the richest bouts of all time in 2015, offers his respect to both fighters. Former UFC light-heavyweight champion Daniel Cormier has weighed in with his contribution from McGregor's mixed martial arts world. Fancy listening to that all again? Well, good news, you can as the fight will be replayed on the hour on BBC Radio 5 live sports extra at 07:00 BST, then again an hour later, and then for a final time at 09:00. Some more quotes from the winner Floyd Mayweather. He says: "I want to thank all the fans from Ireland and all the fans around the world for coming to see this event. I couldn't do any of this without the fans. "Our game plan was to go straight ahead. I said numerous times that I wouldn't back down and that's what I did." Michael Phelps, the greatest swimmer of all time with 23 Olympic gold medals, is a big fan of Mayweather's work tonight. Meanwhile, legendary basketball player Shaquille O'Neal is also impressed by what he has seen. Rio 2016 Olympic taekwondo silver medallist Lutalo Muhammad has paid tribute to Floyd Mayweather. BBC Sport app users may need to click on the link to see the tweet. Two-time world heavyweight champion and maker of a mean grill, George Foreman was a big fan of the action. This is interesting. This is how the three ringside judges scored the fight, until it was stopped in the 10th round. It shows the judges had Mayweather winning by four, seven, and (a pretty generous) eight-round margins. Mark Hampson: McGregor did well but it was a boxing exhibition by Mayweather, with exhibition being the key word. Curiosity sated, boxing wins. Arasa Edwin: Mayweather is the ring master, he is unstoppable. Andy White: Class boxer beats class fighter. What Mike is referring to is what has been a bizarre sideshow in an already bizarre event. American boxer Paulie Malignaggi, a two-weight world champion, was helping Conor McGregor by sparring with him. That was until pictures appeared on social media of Malignaggi seemingly being floored by the Irishman. Malignaggi claimed he had only been pushed to the canvas, then the UFC's Dana White produced this video of the pair boxing together. Malignaggi was not exactly impressed with that and now says he wants to fight McGregor on St Patrick's Day - Saturday, 17 March, 2018. Could it happen? The fact McGregor put up a good show against Mayweather has probably increased the chances significantly. Boxing's reputation wouldn't have been damaged at all by tonight because what we have seen is Conor McGregor show that it is possible to switch between codes. Conor McGregor is now a huge attraction in boxing. This is my first introduction to a UFC fighter so I won't comment on where he will go with them, but I can see another future boxing contest for McGregor. You've seen the sparring videos and their fall-out, so now Conor McGregor v Paulie Malignaggi on St Patrick's Day next March is a legitimate fight. The build-up for that starts now. [Had McGregor won] it wouldn't have damaged boxing. It would have damaged Mayweather's reputation because it would've proved that his wallet and ego was bigger than his brain. His reputation would have been sullied by greed. Pure and simple. Some quotes now from Conor McGregor: "I took the early rounds pretty handy, he adjusted. He's composed - not that fast or powerful, but boy is he composed and he was making me throw. "Fair play to him, what a career he's had. I thought it was a little early with the stoppage. I would have liked to have hit the floor, he [the referee] should have let me keep going. I was just a little fatigued. He was a lot more composed under the shots - that's what 50 professional fights will give you. "I've been strangled on live TV and came back, so I would have liked him to have let it go. It was some buzz. I thought we were close. It was fatigue. The referee could have let it keep going, let the man put me down. "No-one is taking these kind of risks. I'll take it on the chin, it's another day for me." Many people said in the build-up that this fight couldn't count as his 50th win. Believe me, it can after the performance tonight. Clearly, McGregor has proved the doubters wrong and he will be in the dressing room knowing he gave everything he could. Some post-fight quotes from Floyd Mayweather. He said: "McGregor is a tough competitor and we gave them what the fans wanted to see - I owed them for the Manny Pacquiao fight. "He [McGregor] was a lot better than I thought. He was a tough competitor, but I was the better man. Our game plan was to take our time, let him shoot his heavy shots and take him out at the end. "In the MMA, he fights 25 minutes really hard, and after 25 minutes he starts to slow down. I guaranteed everybody this would not go the distance. Boxing's reputation was on the line." On his record of 50-0, beating Rocky Marciano's 49-0, Mayweather added: "Rocky Marciano is a legend and I look forward to going into the hall of fame one day. "This was my last fight tonight, for sure. I chose the right dance partner. Conor McGregor, you are a hell of a champion." The stoppage was too early but only by a second or two because McGregor had absolutely nothing left. But what he did have was pure heart and guts. Nobody expected how he came out in those first three rounds. From round four, Mayweather turned this fight on its head and what a relief it must be for him because McGregor, with the little boxing ring experience he has, did give him something to think about during the fight. It has been a truly astonishing night. I thought my enjoyment of the fight week will have ended last night but we have had a truly memorable Vegas fight night from two remarkable men. Boxing skills are like the elastic in your socks, you'll always have them. Mayweather did try to give us the Mayweather of old but his smile is one of relief as much as celebration. One minute five seconds of round 10 is all it takes. "He is still undefeated, Floyd Money Mayweather," screams Jimmy Lennon Jr.
Floyd Mayweather wins it. He has a 50-0 record. It was a brave, brave effort from Conor McGregor, but in the end Mayweather was just too good. The end comes early in the 10th round. 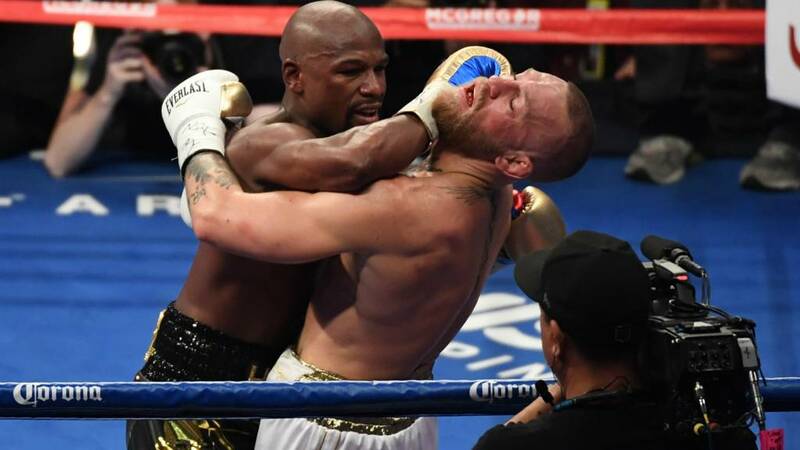 Mayweather attacks again and referee Robert Byrd dives in to save McGregor from any more punishment. A powerful straight right sends McGregor spiralling backwards around the ring, Mayweather lands another two brutal shots to the head, with McGregor dazed and not firing anything back, it is all over.